In a situation worse than Ross and Rachel’s “will they or won’t they” MTV rumors continue to flip-flop over what will happen to TRL. 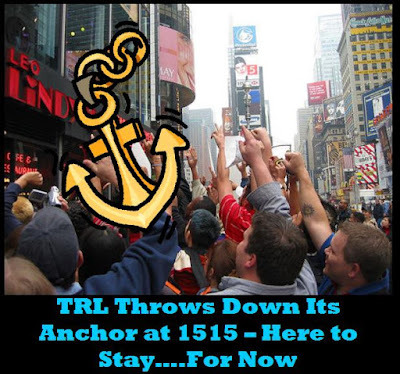 Now the only reason I’m still talking about this is because sources at MTV have informed me that while much of what I’ve written in the past is true, the one about TRL is not true and, for the time being, TRL will remain on the air. Sweet. Do I watch it? No. Will I send my resume to replace Vanessa Minnillo? Sure. What? I could replace her. She can date Nick and I’ll date Jessica. I didn’t know that many of the folks over at MTV read ImBringingBloggingBack, but apparently they do. While they won’t leave comments here, as they would like to protect their identity, they did send me a few emails. They requested that I don’t use their names and, luckily, I’m not that much of an A-hole so I decided to keep them anonymous. Oh, but I did get one email from an MTV staffer who emailed just to tell me I was an idiot. That was sweet. Look at me with “secret sources!” I’m like an actual reporter. Well, not so much a “reporter” as I am a “jackass.” Same thing though, right? So, MTV, I am ready to accept my assignment over at 1515 Broadway. Please see my professional profile right here, click here, yeah right here. As you can see it is very professional. I’ll start Monday. See you then.